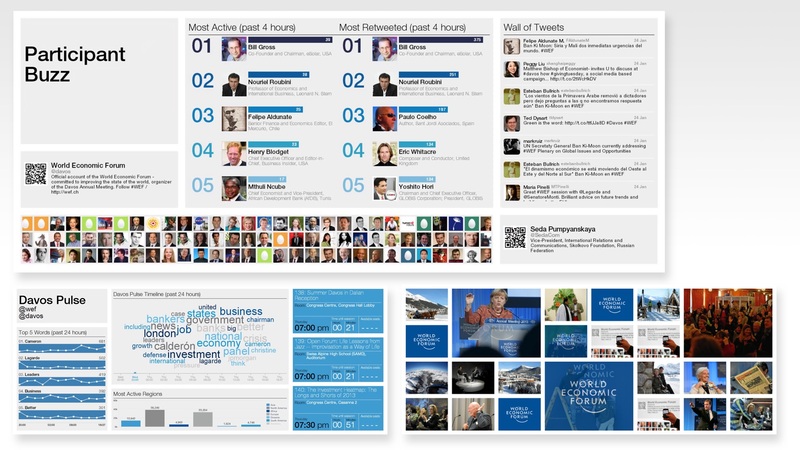 For Davos 2013 we installed an 8.5m x 3.5m “Social Media Wall” outside the main plenary hall. This gave presence to the increasing social media activity from our participants, big data analysis, and the World Economic Forum’s content output to the global public and press. We brought the outside world in, and the inside world out. On the wall we showed data visualisations of Twitter tweets and retweets, trending themes, articles in the reporting press from around the world, a live photo feed of public figures and participants, and webcasts of plenary sessions being broadcast via our Lifestream channels. This was a part of our Global Digital Davos, to increase transparency and access to what is otherwise a fairly elite meeting. What world leaders are talking about and hearing is trending towards a more open dialogue. The response was pretty spectacular. Participants at the Annual Meeting were compelled to ‘game’ the leader board to see their Twitter activity appear on the screen. News crews used it as a backdrop. 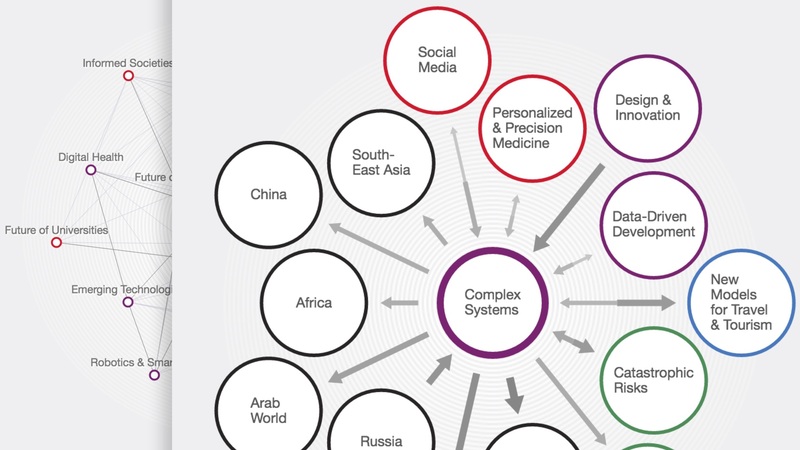 CNN noted how Technology has moved centre stage at Davos, and CNET and other news organisations ran articles on the effect it was having on participants. Several most senior members of SalesForce thanked us for innovating with some elements of their big data product in front of a global audience. I led the concept creation and design, supervised its code Development and Quality Assurance, and ran the content programming which kept this highly prominent screen fresh and interesting for participants over the meeting’s 5 days. The idea began with a napkin sketch, as many good things do. My thought was to focus on making 7 experience templates, each with a specific content purpose, that we could rotate against the event schedule and flow of people. The alternative would have been to mix and match data visualisations – which tends to lack a narrative and be less compelling. A team of five produced and maintained the product. This was comprised of designer, a front-end developer with D3.js experience for the data visualisations, a back end developer who could connect the various APIs and Radian6 feed, a project manager and myself. We also created administration screens to manage the API feeds, the Heroku hosting, and moderate the live content. A small time-to-live delay allowed us to filter out potential obscenities, which came in handy when the bot attack hit.